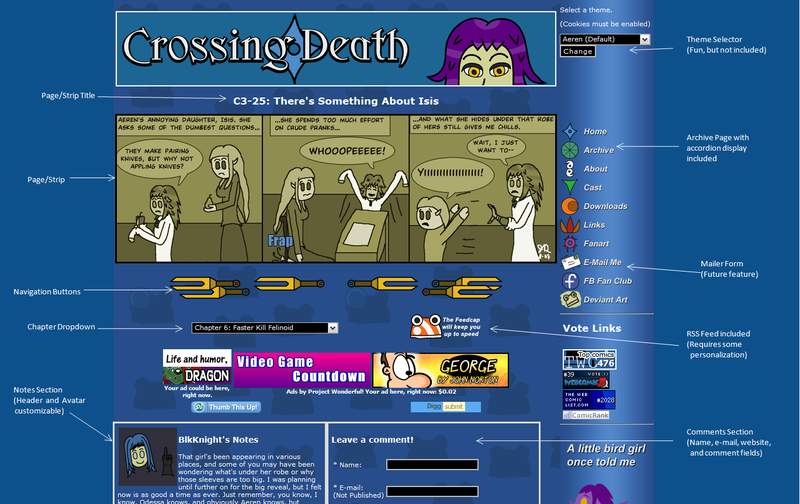 You've all heard me mention my CMS at one point or another on this board. Now it's time for me to actually talk about it and show you some screenshots. 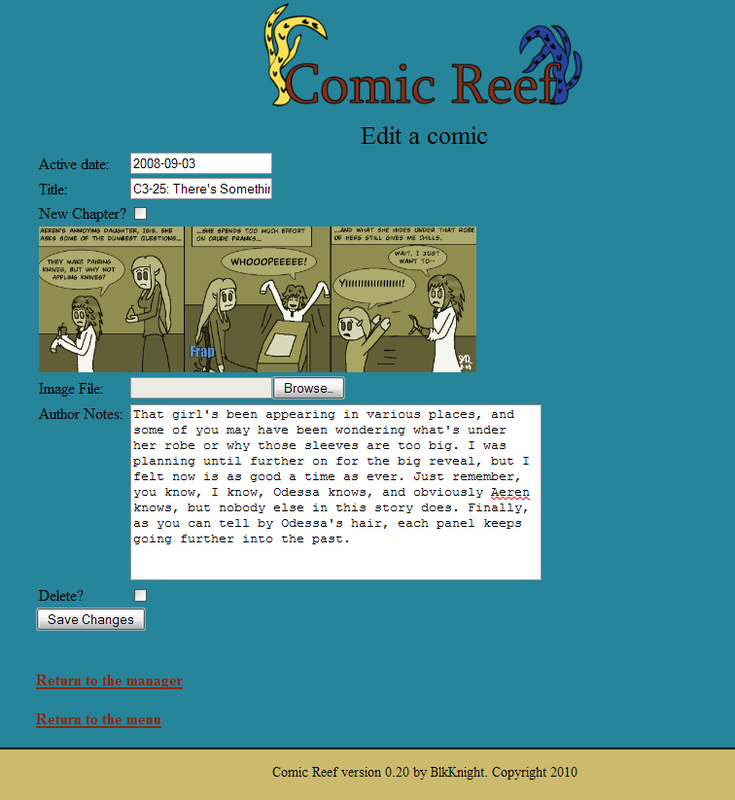 Comic Reef philosophy: Like a coral reef, Comic Reef is merely a single component to build upon your overall webcomic design and structure. It's goal is to provide the maximum level of usability with minimal interference to an artist's web design or structure. For this preview, I'll be showing the system's backend along with some of the implementable code snippets. 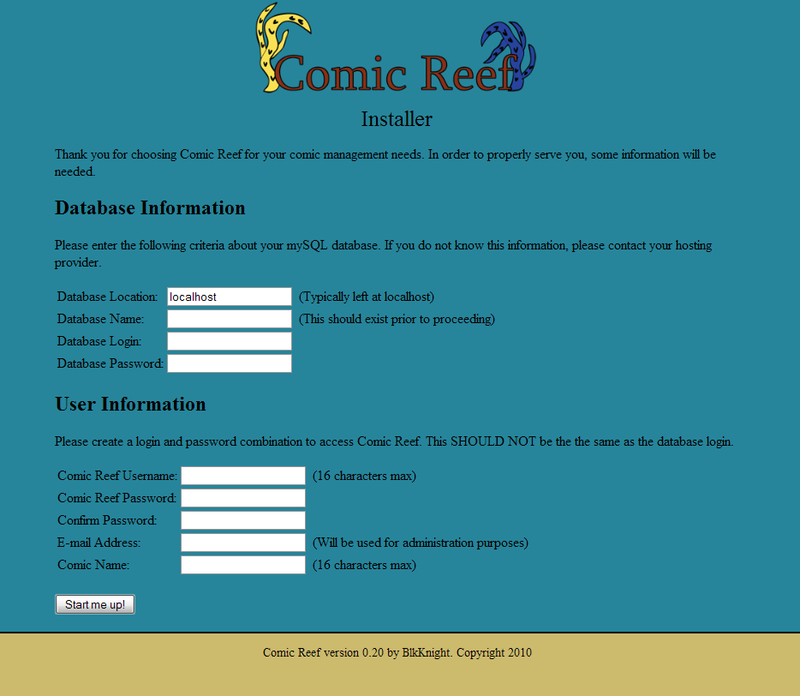 Comic Reef requires a hosting solution that uses a PHP/mySQL configuration. If you don't have this, you cannot run Comic Reef at this time, though I may consider a version that does not use databases if there is enough demand. Provided you do meet the requirements, the installation of Comic Reef is quite painless and only uses one screen. 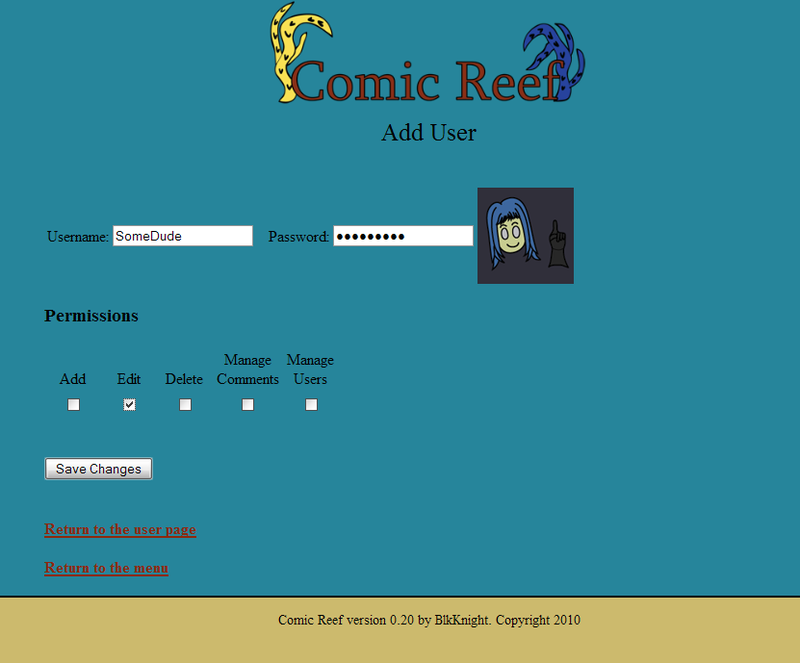 After filling in all the fields, Comic Reef will be ready to use after following the subsequent instructions. 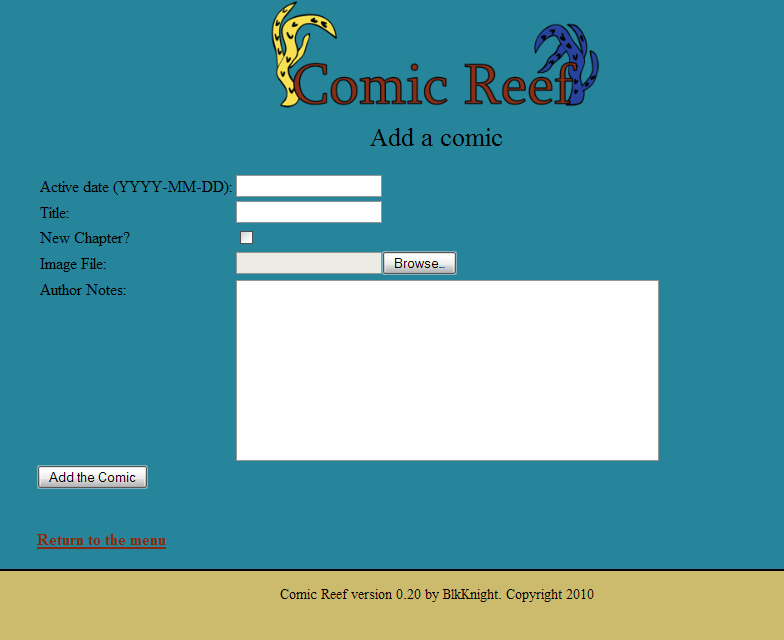 From here, you can either access the Comic Reef template to implement its components or enter the backend to start entering comics. 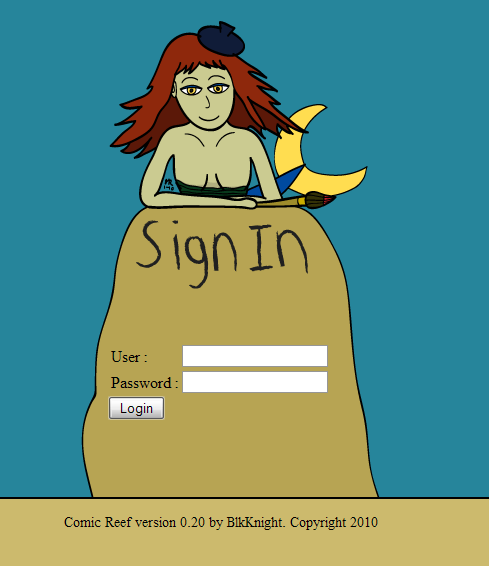 When you do decide to enter the backend through the link the installation page provides, you'll be greeted by Comic Reef's mascot, Cora the Mermaid. Adding a comic is a fairly simple task. Just add a date, title, and the comic image. You can also mark the comic as a chapter to indicate a new section for the chapter select dropdown and the archive page. Since most authors also add notes along with their image, a large input field has been provided. Please note that only one comic can be added for a chosen day to ensure proper ordering. If you ever need to fix something on a comic entry, the ability to fix and delete comics is available. First, the desired comic needs to be selected from the list. The list divides your entire comic database into groups of 30 and sorts them by date. The edit screen looks exactly like the add screen but with the addition of a comic thumbnail and delete checkbox (you will be warned if you check it). The functionality is exactly the same. Also note that deleting a comic will also delete any comments related to it. 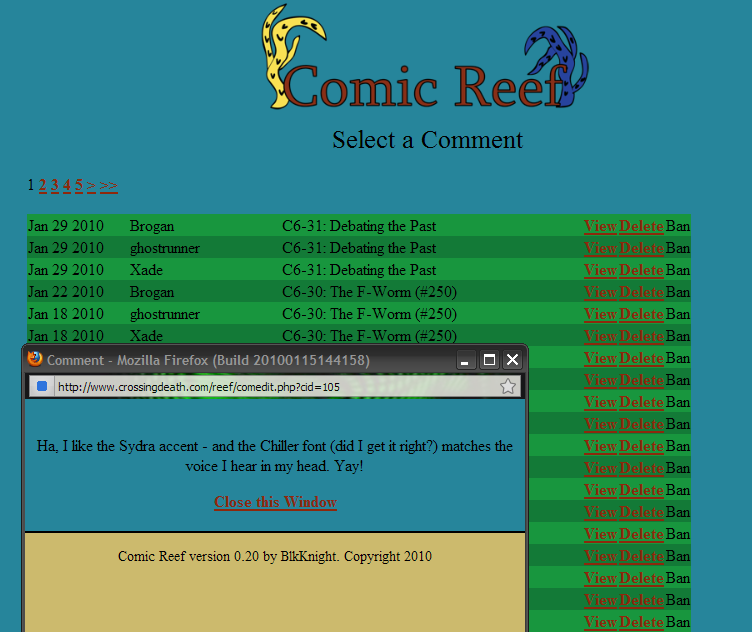 Comic Reef provides you with a comment system but sometimes comments can be of a more. . . questionable nature. To view comments you may have missed or to delete a bogus comment you just need to head down to the comment manager section. Done in the same style as the edit section, this view will provide a popup to let you see the comment, delete the comment from the database, and ban (not yet implemented) a user's e-mail and IP address. There is some anti-spambot functionality built in, so the ban feature shouldn't need to be used too often. Not all comics are created by a single person, so other users will occasionally need to be allowed into the system. Through this section you can manage who can get into what areas and reset passwords. The current permissions available are the abilities to add comics, edit comics, delete comics (subset of edit), manage comments, and manage users. The user entered at the time of installation will be known as the super admin and will permanently have full access to everything. Adding a user is simply a matter of filling out the form and selecting the desired permissions. Extra users can have their permissions edited or be deleted at any time. Finally, since users can be granted access to manage users, safeguards are in place to keep them from deleting or modifying the Super Admin or themselves. Users can also change their password and avatar in another section not shown. 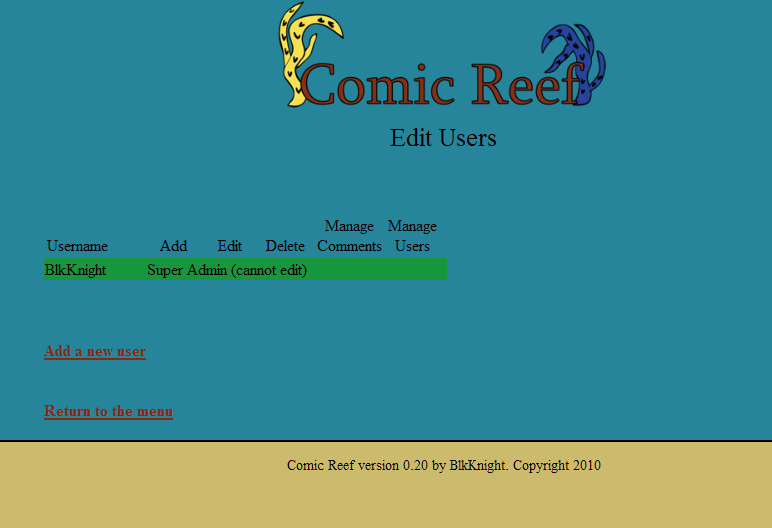 Comic Reef expects you to have some HTML and CSS experience. A bare-bones template, however, will be available for use and documentation purposes. 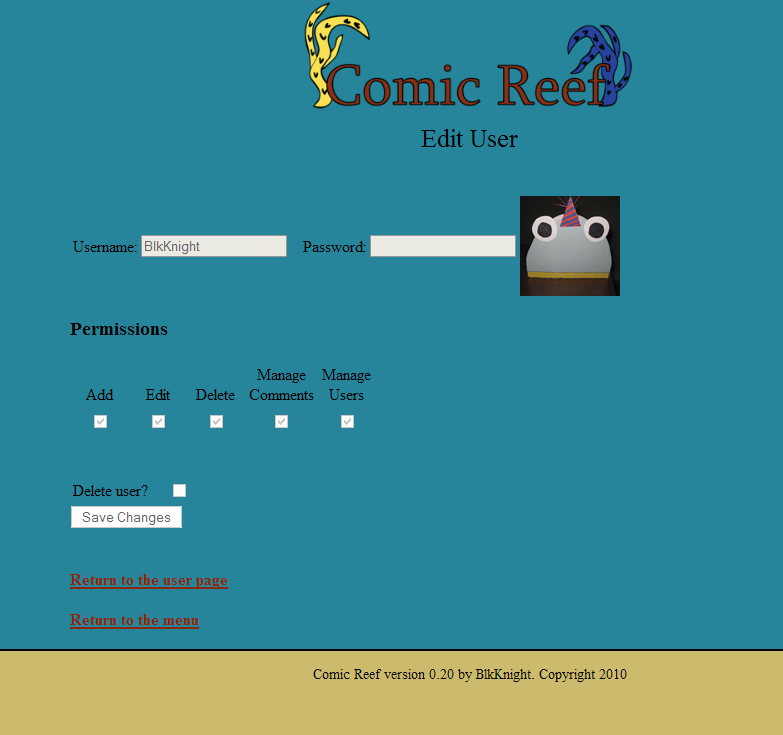 Thus, you can take the template and modify it for your uses or just look at it to see how the Comic Reef system is implemented. Most plug-in code snippets can be copied and pasted into your code with no alteration, but ones such as the navigation buttons will need some user modification so you can use your own buttons. Navigation buttons allow for active and inactive images, and the heading for the author notes can be altered to your liking. Below is a small piece of my site's code that demonstrates the implementation. 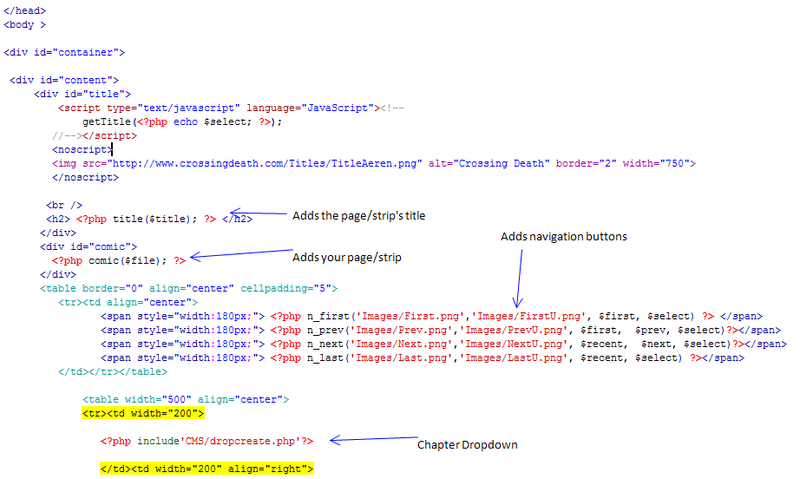 When shown on the website, those single line code snippets show as follows. When Comic Reef exits beta testing, I plan for the following features to be available. Considering the scope of this project and the probability of something going wrong or not as intended, I'm opening a call to beta testers. As a beta tester, you'll be required to install and run the system for a comic and try to find ways to break the code. If you do find any bugs, you will be required to notify me so that I can fix them for the official release. Furthermore, I am also taking suggestions for future additions or aesthetic changes of the system. I'll probably be playing with the logo a bit so any suggestions there are welcome. I feel SO bad that I couldn't be a beta tester after all =[ But as soon as I'm able, I totally want to give this a shot. Your effort is commended, almost-Dr-BK, and I'm really excited for you that word is getting out! I am woman, hear me purr. Congrats on the Fleen mention. Hopefully you will get some decent beta testers out of the attention. Let us know how it goes. I'm Awesome. And you're not! I'm really glad I was accepted into the beta. My favourite feature is how easy it is to incorporate into your existing site. I'd tried going over to comic press a couple of times, and I was not impressed. It would've taken an enormous amount of effort to go through and manually rename each comic in a date format, then make posts from all the right days etc. etc. Once I'd gone through that my site would only look like generic bland comicpress comic #9027864172 and making adjustments would 9 times out of 10 break the functionality. Comic Reef is extremely convenient and very robust. With CR, I can still use all the templates I had created for my site, and editing is just a quick and simple matter of opening up the file in dreamweaver and saving it. So far I haven't had any major problems which weren't just a matter of what important item of code I had overlooked or me putting files in the wrong place. If you want a very functional and flexible comic database without having to start from scratch, then CR will be perfect for you. And no, before you ask, I'm not getting paid to say this. I honestly just think that it's bloody brilliant. I just unleashed the Reef-based TLT on everyone. Got everything tweaked and working quite smoothly. Eventually I'm gonna try and incorporate Gravatar into the comments section. 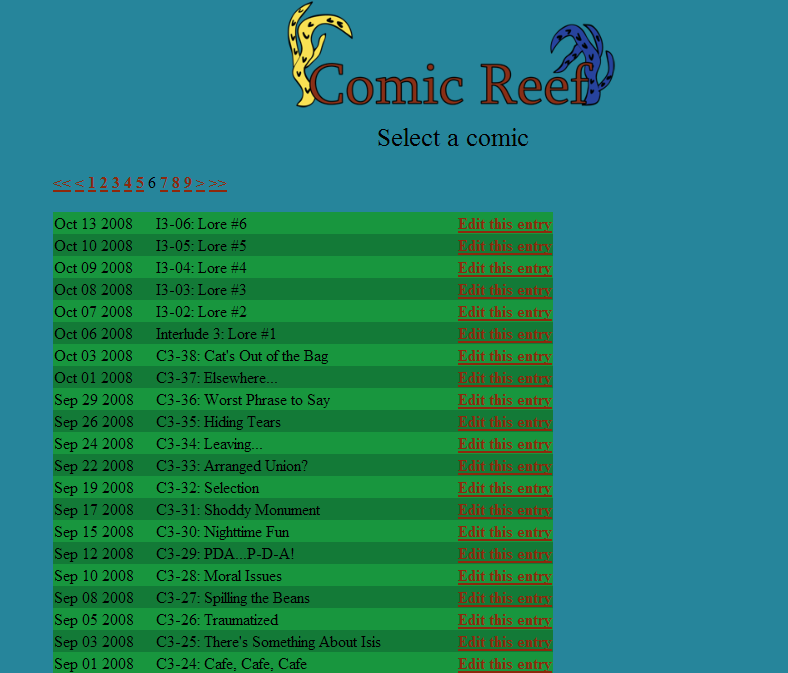 Times Like This - Now powered by Comic Reef! Wow. Nice. Busy but well put together. Like a classy strip joint (get it... strip.... ah never mind). How long did it take you to alter the CMS and did any issues arise? Was anything particularly difficult? It took only a few days - about a couple hours a day - to get everything where I wanted it. It was tricky trying to get the last stuff on the bottom. Originally, on Firefox & iPhone Safari, the "Powered By Comic Reef" and everything ended up on the top right hand corner, but I did a solid-black graphic as a quick fix, and that shifted the other stuff to the bottom. Otherwise everything works like a charm. I just need to figure out how to tweak the "side" class in the CSS file so that the red columns automatically adjust to reach the bottom of the "subcol" box.